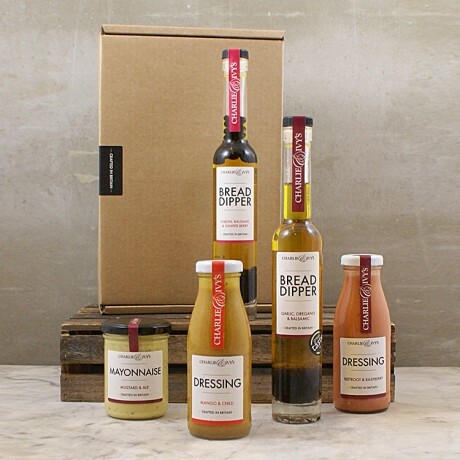 Bringing you our favourite selection of flavours, helping you dip, dress, drizzle and dunk your way into a foodie frenzy, not to mention adding some serious flavour to your cooking too! All brilliantly British and made with tender loving care by us on our farm in the heart of Yorkshire. Perfect for all the Foodies in your life! All products suitable for vegetarians and 100%GM free! Cold Pressed Rapeseed Oil, Water, Dijon Style Mustard (White Wine Vinegar, Mustard Seeds, Water, Sugar, Salt, Stabiliser, Xantham Gum, Tumeric. ), Wholegrain Mustard (Ground Mustard, Water, Wine vinegar, Honey, Salt), Sugar, White Wine Vinegar, Free Range Pasturised Egg, Salt, Mustard Powder, Xantham Gum.